OK got tired of warped and worn weak pulleys on my slab saws so upgraded to cast iron. A bit heavier than normal steel or aluminum so take a bit more electricity to run but that is offset by their longer life span and less maintenance. Note I searched for a LONG time to find the arbor pulley for my LS-12 because the Lortone .pdf file says it's a 4in x 3/4in pulley. But it's actually 3.95in so searching for 4in is a huge waste of time. My loss is your gain though since you saw this post. These babies are worth the extra money and appear to be heavily coated with (enamel?) for corrosion resistance. Nice, but are you going to share where to find these beauties.......? Note: These are also usually available on eBay so shop around for best deal. eBay can be faster since after payment the better sellers have to ship within 24 hours after payment. Amazon is slower especially when you choose free shipping as an option. For eBay buy from sellers with at least 50 ratings and at least 99% positive feedback. In the above example the only place I could locate the 2.25in pulley was on Amazon. Note also the part numbers since there are more than one groove size. Usually for lapidary you want the 4L size which also equates to "A" belts. I went with Amazon for the 3.95in size since the part number matched better than the eBay auction and price with shipping was the same. 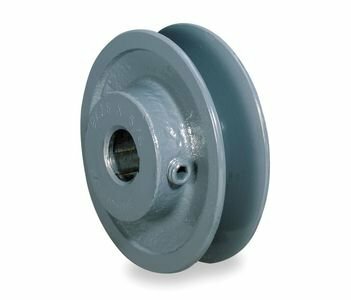 It also might be possible to buy these pulleys on bigger internet websites like Grainger and MSC but I like using Amazon or eBay due to their return policies. I bought the lower priced belts on Amazon but would be curious as to what others are using since there are more expensive rubber woven belts that are more durable. The issue is the cost to replace belts if they get burnt up when a blade gets stuck. How fortuitous! I also have a warped pulley on my slab saw. Makes an AWFUL racket! I also had a terrible time finding a pulley the other day. Basically gave up. I was also searching for a 4" pulley. Go figure. I've generally not had a problem with burning up the v-belt. The motor on the unit seems to overheat and trip the breaker on the motor very effectively. Good thing as I have had many a rock slip. Mill Supply - Salem Oregon, Next to airport. Any listing for machine work. On a very hot day, You best have stretch automobile belts on. under the hood. With S&H it's about $10 more than the China pulley. I recently purchased this pulley off of Ebay, it was considerably cheaper than AMZN's.